Good morning! 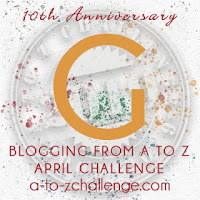 Time to start our second week of the A to Z Challenge and the options for the letter G are endless. So many great gems to choose from. There's Gigi the classic Lerner and Loewe musical that was made into a movie by MGM in 1958. As much as I adore Vanessa Hudgens, I urge you to please not pay any attention to the recent Broadway revival with its unthinkable changes. Sure the subject matter might make a modern feminist raise her perfectly trimmed eyebrow but it is a classic and you don't mess with classics (see my frustration about Poirot's ABC Murders remake) and that includes giving away Honoré's "Thank Heaven for Little Girls" to the ladies to sing. What?! Then there is the gorgeous heartbreaking 2011 Ghost the Musical based on the 1990 Patrick Swayze movie of the same name. Like the 1990 film, the story focuses on young lovers Sam and Molly who are separated when Sam is murdered early into the story and when he discovers that Molly is in danger, he asks a medium, Oda Mae, to help him communicate with Molly. You can find the 2011 London Cast Recording for sale on Amazon featuring Caissie Levy as Molly prior to her transformation as Elphaba in WICKED and Elsa in the current Broadway production of FROZEN THE MUSICAL. And of course lets not forget Gentleman's Guide to Love and Murder that is hilarious x100! I was lucky enough to see the show both when it came to the Ahmanson Theatre in 2016 and again when the non equity tour came to Thousand Oaks in 2017. There really are too many great G musicals so I will leave you with these three gems with the hopes you will go introduce yourself better. Do you have a favourite G musical that I neglected to mention? And yes, I know I didn't mention the catchy Grease but it is definitely not a repeat offender for me like these are. I do wish folks would leave classics alone and not repurpose them to fit current ideas of how things should have been. Unchained melody is one of my favouritest songs of all time. i agree with you many times over (such as the remake of Gigi) but Ghost was a pleasant surprise. ditto! i hear they have TOOTSIE on Broadway now. I loved Dustin Hoffman's interpretation in the movie. Unchained Melody - I think I'll NEVER be able to listen to this song without seeing Demi Moore and Patrick Swayze doing some pottery ;-) Unforgettable! i love Patrick Swayze. Man that scene always brought a tear to my eye.